PATNA: Three politicians who raised a banner of revolt against their party leadership have landed in trouble. Right now, their fate hangs in balance as none of the two major coalitions have showed interest in them. The first in the list is Pappu Yadav, sitting parliamentarian from Madhepura Lok Sabha seat in Bihar. Yadav who won on RJD ticket last time got himself locked in a succession war with party chief Lalu Prasad soon after winning the LS polls, claiming himself the real inheritor the party chief. The overall situation turned so serious that the RJD expelled Yadav for six years. Subsequently, he formed his own political outfit, Jan Adhikar Party (JAP) and launched intensive tours of the state seeking support of the masses but it has failed to attract the masses. In the last assembly elections, Yadav fielded many candidates but drew a blank. For the past several months, he tried hard to be a part of the NDA but his party was not given entry. After failing in his attempts, Yadav tried hard to become a part of the opposition Grand Alliance (GA) but has been denied place here too. A disappointed Yadav has now served 24-hour ultimatum to the GA failing which he will be compelled to contest elections from both Madhepura and Purnia LS seats. Given the strong opposition from the RJD, his request is not likely to be considered. The second in the list is Arun Kumar, sitting MP from Jehanabad. Kumar was declared elected on the ticket of Rashtriya Lok Samata Party (RLSP) headed by former union minister Upendar Kushwaha. The RLSP is now a part of the GA. He too rebelled against his party chief and formed his own party, “Rashtriya Samata Party” but has failed to leave its mark. Kumar too tried hard to became a part of both NDA and the GA but his efforts have gone in vain. He was hoping to get ticket for Nawada seat from the GA and had been working there for sometime. Denied ticket, he has now announced to contest elections from Jehanabad seat again. The last one is rebel Janata Dal United (JD-U) leader Sharad Yadav who revolted against chief minister Nitish Kumar after the latter broke away from the GA to form his new government with the BJP. 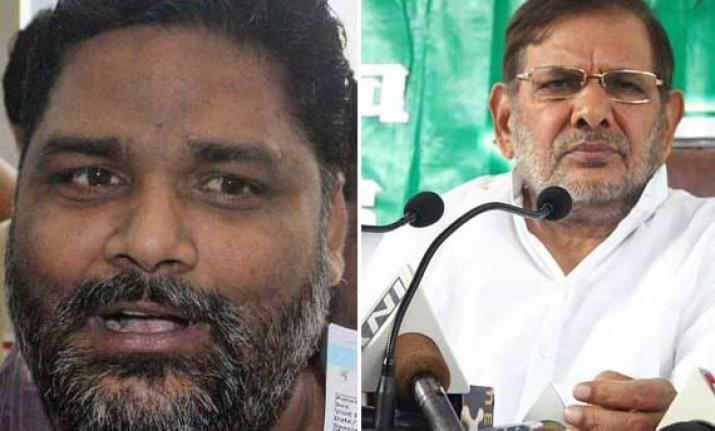 Angry Sharad also attended the RJD rally held at Patna’s Gandhi Maidan despite JD-U warning after which the JD-U sought for termination of his Rajya Sabha’s membership from Rajya Sabha chairman Venkaiah Naidu for indulging in anti-party activities. Eventually he was disqualified from the Upper House of the parliament. Left in the lurch, Sharad later formed his own party Loktantrik Janata Dal (LJD) hoping to be a part of the GA. However, the RJD has decided to field him from Madhepura seat on its symbol with the condition that he will merge his party with the former after election.